Chhattisgarh, April 25: A CRPF soldier, who was injured during a gunbattle with Maoists in Kalapathar area of south Bastar district of Chhattisgarh on Monday had said 70 per cent of the Maoists were women. A soldier who refused to be named said that women Maoists were more when compared to men who attacked the soldiers with AK-47. Another soldier said that after killing the soldiers the women stole the weapons and ran away. At least 26 CRPF jawans lost their lives on April 24 during a fierce gunbattle with Maoists in Kalapathar area of south Bastar district of Chhattisgarh. The incident took place around 12.25 pm on Monday, when the CRPF troops belonging to the 74th battalion of the force were providing security for road construction work. Home Minister Rajnath Singh and CRPF Additional Director General Sudeep Lakhtakia on Tuesday arrived in Raipur at around 10.30 am and directly headed to the headquarters of the 4th battalion of Chhattisgarh Armed Force in Mana camp area where the wreath-laying ceremony was held. The Committee for the Defence and Release of Dr GN Saibaba expresses its shock and dismay at the judgment delivered on March 7, 2017, by the Court of Sessions Judge at Gadchiroli District (Maharashtra) in the case of State vs Mahesh Tirki and others convicting all the six accused under various sections of the Unlawful Activities (Prevention) Act, 1967 and 120-B of the Indian Penal Code. While five of the accused – Mahesh Tirki, Pandu Narote, Hem Mishra, Prashant Rahi, and GN Saibaba – were awarded the maximum sentence under the relevant provisions (i.e., imprisonment for life), one accused – Vijay Tirki – was awarded a ten year sentence of rigorous imprisonment. Although a conviction by the trial court is but the first ordeal in the long winding legal process, the conviction itself comes as a bolt from the blue for all those who have been following the developments of the case, which was built on flimsy grounds, bolstered with concocted evidence and tutored witnesses, and burdened with shoddy investigation and procedural lapses. It was only to be expected that the whole edifice would come crumbling down. However, the sessions judge thought otherwise. Many legal minds have already analysed the judgments and pointed out the glaring loopholes and legal infirmities. The Committee has also come out with its own critique of the judgment. The most worrisome aspect of the judgment is that it sends the ominous message that there is no space for dissent in our times. The judgment repeatedly points out how wrong it was for Dr GN Saibaba and others to hold certain views that were in opposition to that of the State and the dominant groups. It is ironic that even while holding that these six people are so dangerous that they should be incarcerated for a major part of their lives, the 827 page judgment fails to point out even a single instance of violence that these people have been conspirators in or lent logistic support to. It is a pity that the judiciary that should buttress the rights and liberties of the citizens become not just a silent spectator of the infringement of the rights, but become an active collaborator in the ushering in of a totalitarian regime. Although all the six who have been convicted are facing hardships and fighting inclement weather and adverse conditions in the prison cell, Dr GN Saibaba’s case needs a special mention not only due to his 90% disability, but also due to his failing health conditions. In fact, just before the judgment was delivered, Saibaba was hospitalized and was undergoing treatment for gall bladder stones. Apart from the chronic issues with his heart and high blood pressure, Saibaba was also suffering from acute gastric condition resulting in cardiac condition along with palpitations. It was indeed the prolonged incarceration in the anda cell as an under-trial that worsened his condition to this level. Now, even before he could fully recuperate the judgment has been delivered, and we fear that given the dismal track record of the Nagpur jail authorities in caring for his health, his life is in real danger. In an utterly callous manner, the trial court refused to pass any order instructing the jail authorities to give adequate medical care to Saibaba, in spite of the fact that it is on record how inhumanly the jail authorities had treated him earlier. The High Court and the Supreme Court had even censored the jail authorities and given strict instruction to give him proper medical care. Dr Hany Babu emphasised that the judgement is not just a conviction of Prof Saibaba and five others, but it puts all democratic values on trial. It is an attack on all sections of intellectuals, teachers and students who espouse and cherish the value of ideas, progressive thought and dissent. Hence, there is a need for a cross-section of teachers and students to come together to speak up against the stifling of voices in universities and space across the country. The chairperson of the Committee for the Defence and Release of Dr. GN Saibaba, Prof Haragopal addressed the gathering by reminding everyone that the case of Prof Saibaba was similar to the trial of Dr. Binayak Sen. Further, he insisted that this case is not confined to only the six convicted individuals, but democratic values have been put at stake. Adding that people were persecuted for their ideas in the medieval times, and that such a judgement in a modern democratic framework echoes something extremely troubling. He urged that this judgement reflects democracy on death bed in which our ideas and thoughts will be persecuted and stifled. Quoting the Kothari Commission, he emphasised that the function of a university is to critically assess the manner in which society lives. As professors and teachers, it is these values and opinions about the nature of society and life that are discussed in classrooms. But this judgement strikes at the very core of this right to exchange ideas and values. Hence, he appealed to the press and all who had gathered to come together to mobilise against the increasing instances of stifling of dissent and curbing of democratic values. Adding that a judge should always be driven by constitutional laws, he said that role of the judiciary is to check the functioning of the executive and ensure the executive does not become despotic. But, if the judiciary itself starts bypassing its role, then it points towards a dying democracy. Addressing the press, another member of the Defence Committee and editor of Mainstream Weekly, Sumit Chakraborty, shared his thoughts on earlier judgements delivered by the Supreme Court which declares that no individual can be punished for mere association with an outlawed organisation. He concluded by highlighting the need to mobilise and come together in huge numbers to speak about our right to expression and the need to galvanise public opinion about the travesty of justice that clearly emanates from this judgement. The next speaker, Pankaj Tyagi, was one of the lawyers who helped draft the comprehensive critique of the judgement. He elaborated on loopholes and the weakness of the prosecution’s arguments. He further explained the manner in which police and the state had already tailored and planned a case and conviction since the first day of abduction and arrest of three individuals, Hem, Mahesh and Pandu in August 2013. Alongside, the critique of the judgement titled, When the Prosecution’s Case Becomes the Onus of the Judge, was released as a booklet in front of the press. Hem Mishra’s father addressed the gathering by speaking about his experience with the case for the last three years. Questioning the very nature of this democracy, he asserted that in this “democracy”, freedom is only for the ruling classes and the marginalised people and those who stand with their struggles are being persecuted. He further appealed to all progressive and democratic sections to mobilise among the people to raise concerns about the political climate in the country where all forms of dissent are being criminalised. Another member of the committee, Prof N Sachin directed attention towards the conditions in Delhi University where there has been a conspiracy of silence with respect to Prof Saibaba’s case which raises questions about the deteriorating political climate all around us. DUTA President and member of Defence Committee, Prof Nandita Narain, expressed her concerns about the deteriorating health conditions of Prof Saibaba and the urgent need for medical treatment. Stressing on Prof Saibaba’s witch hunt within Delhi University, she further spoke about the increasing legitimisation of rigwinght forces in university campuses. What cannot be overlooked is the alarming disparity between various judgements that have come in recent times where those against whom there are clear evidences of instigating mob violence, engineering riots and blasts were acquitted by higher courts. The same judiciary has now punished people with life imprisonment for merely upholding an idea. Challenging the judgement, she stated that the life imprisonment of a 90% disabled person is a clear attempt to murder that person by the ruling political dispensation. Finally, Vasantha, Prof Saibaba’s partner spoke about the conditions in prison which has adversely impacted Saibaba’s health even during his previous incarceration. Despite that, the judge and jail officials have not taken his medical emergency into consideration. She added that this development is anti-people and the most marginalised sections of adivasis have organised against this form of anti-people development. It is evident that the government is hence targeting all those individuals, activists and intellectuals who are allying with people’s demands and against the present policy of development. She emphasised that it is precisely because of Prof Saibaba’s unrelenting stand with peoples’ movements and voicing opinions against Operation Green Hunt that he along with others have been convicted. The Committee calls upon all democratic minded individuals and organisations to join hands and fight against injustice meted out to Dr GN Saibaba and the five others who are convicted. It should be noted that one person, Prashant Rahi is a journalist, another (Hem Mishra) a student, and three others are adivasis. The legal process will definitely take its due course. In fact, the appeal against the Sessions Court judgement has already been filed in the Nagpur Bench of the Bombay High Court and the records have been called from the trial court. Apart from pursuing the legal struggle, the Committee proposes to hold public meetings and other programmes and solicit your active participation and active cooperation in building a public opinion against such gross violation of our fundamental freedoms. In standing for the demand for acquittal of all the six we ensure our fundamental freedoms as well! AVANINEWS TEAM SADLY INFORMS YOU THAT OUR DEDICATED REVOLUTIONARY COMRADE NARAYAN SANYAL OF CPI (MAOIST) HAS DIED IN HIS 84TH YEAR, ON APRIL 17TH, 2017. He died in hospital in Kolkata, after a long illness. Comrade Narayan Sanyal will live on in the movements that he helped build across the country; in the revolutionary inspiration and ideas that he gave; in the memories of the humaneness that he brought to every situation he touched. 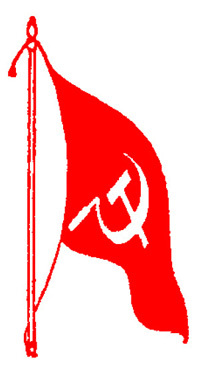 A top Maoist think-tank and leader of the Communist movement in Bengal, Narayan Sanyal joined Communist Party of India – Marxist-Leninist (CPI-ML) in the ʹ60s. He left his job in a bank in Kolkata to join the Charu Majumdar-Kanu Sanyal led movement. After a split in CPI-ML in the ʹ70s, when Biharʹs leader Satyanarain Singh revolted against the ML leadership, Mr Sanyal was sent to Bihar to replace him. Later he was arrested and sent to Kolkata. Mr Sanyal remained in jail till Left Front came to power and granted a general amnesty to many of the leaders associated with the ML movement in the State. But soon after his release – quite 40 years ago – Mr. Sanyal went to Bihar started working with CPI-ML – Party Unity (PU), which was an union of ML leaders in Bihar and Bengal. He worked hard in the villages of Bihar to strengthen Party Unity at the grassroots and later merged with Peopleʹs War Group (PWG) to form the CPI-Maoist. He was arrested a decade back in Chattisgarh and kept in various jails of central India. ʹKnown for his mental agility and thick moustache, we often used to refer him as ʹStalin,ʹʹ said one of his old but jubilant party comrades in Kolkata, who now works as a publisher. Many of his old comrades in Kolkata were keen to meet him after nearly half a century later, when he was released from jail two years back. 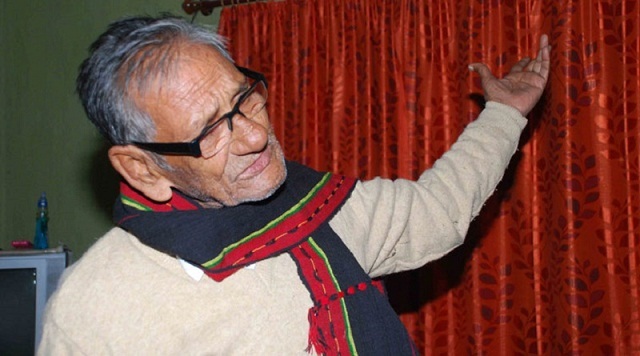 ʹTHOUGH DEATH BEFALLS ALL MEN ALIKE, IT MAY BE WEIGHTIER THAN MOUNT TAI OR LIGHTER THAN A FEATHER.ʹ COMRADE NARAYAN SANYAL DIED FOR THE PEOPLE, AND HIS DEATH IS INDEED WEIGHTIER THAN MOUNT TAI. HE WILL BE REMEMBERED BY THE REVOLUTIONARIES OF THE WORLD, AND IN HIS NAME, AND MANY OTHER MARTYRS, WE WILL SPREAD THE FLAME OF MARXISM-LENINISM-MAOISM AND PEOPLEʹS WARS! 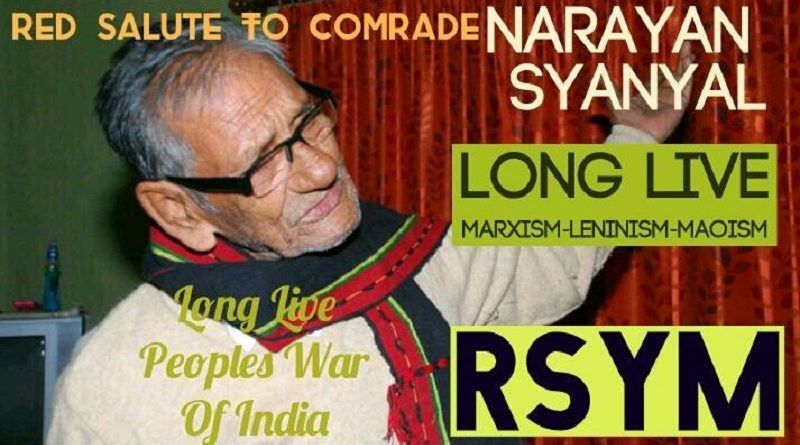 LONG LIVE MEMORY OF COMRADE NARAYAN SANYAL! The people who wished boldly to write a new history of India, Narayan Sanyal was one of them. 70’s turbulent decade of armed peasants revolutionary movement, Nakshalbari inspired Narayan Sanyal to be associated with revolutionary politics. Narayan Sanyal understood that to be a revolutionary someone have to leave personal interests and desires. So he had resigned his bank job and went to village. At the end of the 70’s decade, when the CPI (ML) split into various group he was in the CPI (ML) (Party Unity), farmer based party in Bihar, whose leader was he. In the unity process between Party Unity and the CPI (ML)(PW) he was in the first row. At least in 2004 the new emergence of the Maoist movement in India he played a vital role in CPI(Maoist) party. And elected as a politburo member of this party. Life time communist revolutionary Narayan Sanyal was arrested in 2005 and spent nine years in prison. In 2014, when the state has realized that Narain has lost his ability to function physically, he was released in 2014. since he were in Kolkata. He died of cancer yesterday, we lost one of the combative fighters of revolutionary struggle. After death, he will be dynamic among us, through his lifetime revolutionary activities. Our responsibility is to pursue/complete his unfinished work. The 117 of the arrested workers have been acquitted of all charges, though there was a common charge against all 148 workers.These workers were forced to spend 31 months in prison for no fault of their own. Their fundamental right to life and liberty was attacked, yet no one is going to be punished for it. It should be a matter of grave concern for every Indian that while the leaders of some of the most henious pogroms in independent India have not been even touched by criminal justice systemt, workers of Maruti Suzuki have been sentenced to life imprisonment on flimsy evidence. Another development is the use of private armed guards by employers for threatening workers. According to workers of Honda scooter plant in Alwar, Rajasthan, their strike last year was broken by the management with the help of armed thugs, who had assaulted them inside the plant, and also in the city in full public view. Maruti Suzuki workers have also alleged that on the day of violence large number of hired bouncers were roaming inside the plant and threatening workers. Maruti Suzuki workers have braved through sinister schemes of management, government, and police, and are standing firm in their commitment. All the workers sentenced to life imprisonment by the court were below thirty when arrested by the police. Their commitment for working people’s rights needs to be contrasted with the violence of activists of Sangh parivar against minorities, Dalits, and students and teachers of universities with full support of Modi government. A top ranking leader of the outlawed Communist Party of India-Maoist [CPI-Maoist], Narayan Sanyal passed away late on Monday night in a south Kolkata hospital. He was in his early 80s and was suffering from cancer. Sanyal was the Polit Bureau member of the CPI-Maoist at the time of his arrest in 2005 and perhaps the second most important leader after the party’s national secretary, Muppalla Lakshmana Rao. Born in an affluent family in undivided Bengal’s Bogra district, now in Bangladesh, Sanyal was known for his keen interest in football. His father was the district chief of Congress and was a generous host to many of the leaders, including second Chief Minister of West Bengal Bidhan Chandra Roy and Congress leader Sarojini Naidu. 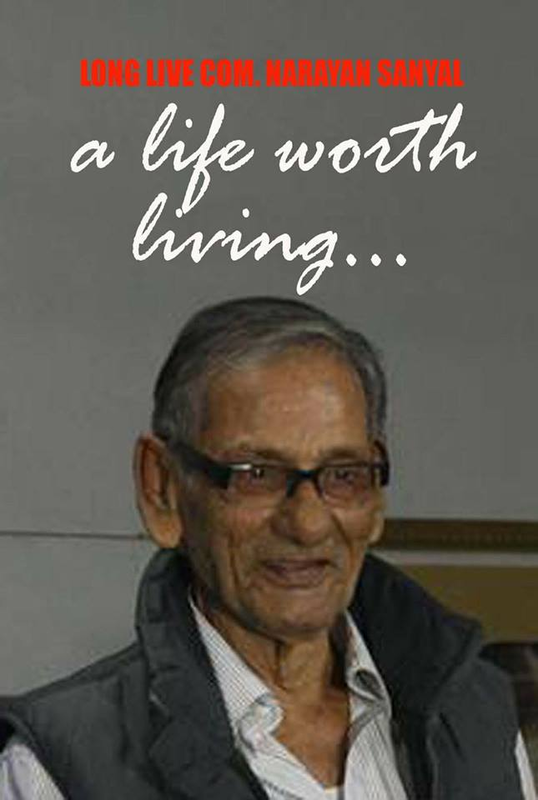 Sanyal and his family shifted to West Bengal in the 1940s and he got a job in a bank. “I worked in the United Bank of India in Kolkata, which originated from Comilla Union Bank in Bangladesh,” he once told this correspondent. He soon left the job to join the CPI-Marxist-Leninist [ML] in the 1960s. After a split in the CPI-ML, led by Bihar’s leader Satyanarain Singh, Sanyal went to work in Bihar among the landless and marginal peasants. He was arrested in 1972-73 and released in 1977 as a part of general amnesty granted to many ML leaders, soon after Left Front came to power in the State. Following his release Sanyal again went back to work in central Bihar with CPI-ML-Party Unity, which was formed in the early 1980s with the merger of various ML factions. Party Unity led movement gained momentum in the central Bihar throughout the 1980s, resisting the private army of the big landholders. Sanyal played a key role in leading the movement. He eventually became the secretary of the Party Unity. 1990s was a decade of merger between various Naxalite factions. In the early ’90s, Party Unity, Maoist Communist Centre [MCC] and Telengana-based CPI-ML People’s War [PWG] came together to fund a frontal organisation; later– in 1998– Party Unity and PWG merged. Sanyal played a key role in these mergers. He also played a significant role in the merger of PWG and MCC in 2004- a merger that formed CPI-Maoist. However, he has never documented the historical context and the conditions behind the mergers of the main Marxist-Leninist outfits and religiously refused to give a formal interview. “With his death thus we lost solid historical perspective of the ML movement in this country,” said a senior intelligence officer, who interrogated Sanyal. Sanyal was described as “an unorthodox, non-sectarian and exceptionally humane leader” by one of his comrades. A strong proponent of collective leadership in the party, Sanyal even started to “analyse Indian elections closely” in his declining years, the activist said. India Campaign – Freedom for Ajith, Saibaba and all political prisoners! I gathered evidence that suggested rulling class wanted access to Adivasi (Tribal) resources no matter what. So Opperation Green Hunt was launched by government to kill, maim and dislodge the tribal people —G. N. Saibaba. Free Prof GN Saibaba, Com. Hem, Mahesh Tirki, Pandu Narote, Prashant Rahi and Vijay Tirki Immediately and Unconditionally! Protest by students of Panjab University (PU) against unprecedented fee hike witnessed brutal lathicharge and usage of tear gas as crowd dispersal method leaving 4 students critically injured. Photojournalists covering the protests were attacked by police as well and more than 50 students have been arrested by the local police while 66 students have been charged with rioting, causing damage to public property and sedition which was later dropped. The massive increase in the fee structure by the University for the Session 2017 – 2018 due to the financial crunch has lead to agitation by the students. The financial crunch is a result of massive cut down in grants by UGC and MHRD to institutions of higher education. The fees for Pharma course, has been raised from Rs 5,080 to Rs 50,000 whereas for Dental, the fees has been increased from Rs 86,400 to Rs 1.50 lakh. Infact, University saw fee hike upto 1100% in one of their courses and as a result, several student organizations within the campus which included Students for Society (SFS), National Students Union of India (NSUI), Panjab University Students Union (PUSU) joined the agitation and gave united call for ‘Panjab University Bandh’. On 11.04.2017, hundreds of students boycotted their classes and assembled for a protest at the office complex of Vice Chancellor Arun Kumar Grover and started sloganeering against MHRD, University Grants Commission (UGC) and Central Government for restricting the access to higher education by surge in fee structure. While students asked the VC to come out of his office and demanded a roll – back of the fee hike, police began using water cannons to disperse the crowd. In response, students hurled stones against the police personnel and then the police fired tear gas shells towards the students. Tear gas shells were even hurled at University hostels. As a consequence several people especially female students were injured and they sought medical assistance but when the same was not provided, students marched towards VC office and were mercilessly lathicharged by the police. During the melee around 22 police officers got injured too. While students dispersed post-lathicharge, police followed and nabbed students and assaulted them in public. Some of the students took refuge in the University’s Gurudwara to save themselves from police’s barbarity. Police surrounded the Gurudwara and arrested more than 50 students and filed FIR against 66 students under Section 147 (rioting), 148 (rioting with deadly weapons), 149 (unlawful assembly), 332 (causing hurt to public servant to deter him from his duty), 353 (assault/criminal force to deter public servant from his duty), 186 (obstructing public servant in discharge of public function), 308 (attempt to culpable homicide) Indian Penal Code and Section 3, Public Property Damage Act, 1984. In total disregard to the law of the land, seven students have been reported to be tortured in police custody and the arrested students have not been produced before magistrate yet. Though the charge of sedition has been dropped on the request of the University later but this incident again brings forth the arbitrary use of the colonial law of sedition to silence the dissenters. Police being present in university campuses and students being brutally beaten up and assaulted when they stand for their just demands and causes have become the new normal. This adds to the organized attack on the students’ voices which has been witnessed earlier in Delhi University, Jawarhlal University, Hyderabad Central University and Allahabad University. The crackdown on the protesting students comes in the backdrop of the systematic attack against higher educational institutions which hits at the students’ right to education. With each passing day, education is becoming a luxury which only the rich can afford. Recently, Tata Institute of Social Sciences, Mumbai shut down three of its centres due to refusal by UGC to release money allocated for them and Jawaharlal Nehru University witnessed massive seat cuts in their MPhil/PhD courses. The attack on students of Panjab University has to be seen in the context of the larger fund cuts in higher education by MHRD and UGC. The Budget allocation for the University Grants Commission (UGC) has been cut by almost 55 per cent, from Rs 9315.45 crore in 2015-16 to Rs 4286.94 crore in 2016-17. In fact towards the end of 2015, the UGC failed to allocate any funds to Panjab University. Even back then the MHRD introduced a 25% reduction in grants to higher education, which affected the UGC’s budget. These cuts have led to universities raising funds through internal means including fee hikes, as in the case of Panjab University. Therefore PUDR holds the policies of the government responsible for promoting education driven by profit and depriving needy students from access to higher education. FIR filed against students of Panjab University be withdrawn and the detained students be released immediately. Proposed fee-hike by the University (2017 -18) be rolled back.